Have you noticed that most Christmas treats are all about the chocolate? That’s because chocolate makes everything better! These two recipes are party worthy! Peanut Butter Brownie Cups is another one of my old school go-to recipes. I’ve never seen anyone turn these babies down! Preheat oven to 350. Place paper baking cups in muffin pans. Combine brownie mix according to instructions on the package. Fill baking cups 2/3 full. 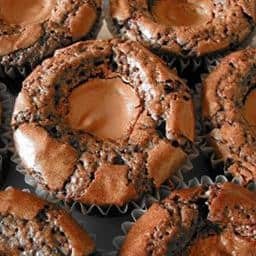 Remove wrappers from peanut butter cups; set one in the center of each brownie cup and press down until the batter meets the top edge of the candy. Bake at 350 for 20-25 minutes. Makes about 1-1/2 dozen. Make sure you include Chocolate Chip Cheese Ball on your dessert bar. 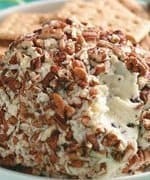 I love to watch people’s faces when they bite into this dessert cheese ball! I call it the cheese ball gone rogue! It’s pure awesomeness on a party platter! In a mixing bowl, beat the cream cheese, butter and vanilla until fluffy. Gradually add sugars; beat just until combined. Stir in chocolate chips. Cover and refrigerate for 2-3 hours (or overnight). Just before serving, shape into a ball and roll in pecans. Serve with graham crackers.